Arts Award for Lifetime Achievement, 13 October 1987. Thank you very much Pauline and ladies and gentlemen. I suppose if one gets a lifetime achievement award one must have done fairly well in what we’re told is the primary Canadian virtue––survival. I’ve lived in Toronto continuously for nearly sixty years, and as your hostess remarked earlier this evening it wasn’t always a fun town. In 1929 there were no decent restaurants––after all it was an Anglo‑Saxon community. There was nothing to drink––after all it was Ontario. And there were millions of churches. There was only one thing to do on Sunday but you had a lot of choices to do it. 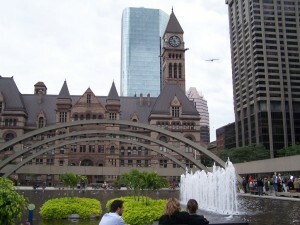 From there, of course, Toronto grew into this tremendous, exhilarating, cosmopolitan city. One disadvantage of a city as it grows larger is that it gets more impersonal, and there’s less a sense of belonging. What this extraordinary honor has done for me is to make me feel that not only does Toronto care about its own cultural life, not only is it aware of it, not only does it want to encourage it, but it gives those who live and work here a sense of belonging. That is the feeling that I think I would have had in any case if anyone else in my field had got the award, but then, of course, I wouldn’t have had a chance to say so. This entry was posted in Uncategorized on May 2, 2012 by Bob Denham.